Marinate the beef strips in the marinade ingredients for up to 30 minutes. 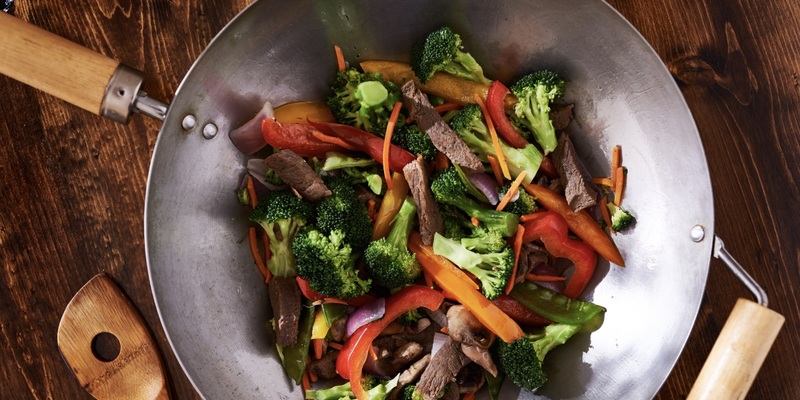 Heat the oil in a non-stick wok or frypan. Drain the beef strips from the marinade and cook in batches over high heat until just brown. Remove beef and wipe out pan. Spray pan lightly with olive oil spray. Add the mushrooms, baby bok choy, gai lan and snow peas and sauté for 2 minutes until snow peas are lightly cooked but still crunchy. Return beef to the pan and stir to heat through.